Favorite game: He loves being outside and just running around.... "I love to run the fence at the dog park, with the big dogs, on opposite sides, of course! But I like to play, so any game I am playing at the time is my favorite." Favorite treat: Mommy likes to feed me healthy, natural dog treats. I love carrots and green beans! They are my favorite. Pet Peeve: "I don't like it when my older "brother" gets any attention whatsoever. I should always be the center of attention!" About Me: I am one spoiled Miniature Schnauzer. "It's ALL About ME!" I was a Christmas gift to my human Mom, and as she puts it I truly am "The GIFT that keeps on giving!" She is loves me so much as I do her. I really got it made here, at my home. Miniature Schnauzers sure are a special breed, indeed. They are super smart, very affectionate, and have a wonderful temperament. They are happy dogs with loads of personality and will keep you laughing and amused. They truly make great companions and they are completely devoted and loyal to their family. They do love being the center of attention and want and need to be involved with the daily activities of their family. You can learn all about the Miniature Schnauzer right here on Schnauzers Rule. And don't forget to enter your Miniature Schnauzer in our Schnauzer of the Month contest! 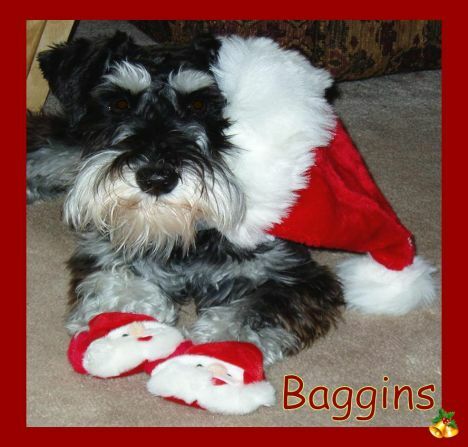 Once again, congratulations to our Miniature Schnauzer Baggins!